SciTech Academy’s core program will include a complete k-8 STEM curriculum support by the top Science Education Centers in the Nation and will be supplemented with a STEM literacy series. Our program will incorporate units of study designed early career and college readiness programs. As researchers supported every single dollar invested in Kindergarten will have seven dollars as a return on investment back to society. SciTech will invest heavily in STEM, plus College Readiness programs. This will create a successful story for the next generations. The SciTech Academy prospective ideas and philosophy is to build framework model for a global study through literacy, high level vocabulary, and nonfiction text with culminating projects in math and science that can be differentiated by grade and ability levels. Our model of project-based learning will hold students and teachers accountable by using rubrics from the best K-8 STEM Curriculum models from STEM Support centers, like University of Minnesota STEM and Science program. SciTech Academy will discovery STEM partner, which offers a variety of modules for students to deepen their STEM knowledge and practice their 21st Century skills by working in collaborative teams on real-world problems. SciTech Academy plans to offer an extended day program to meet the needs of our high achieving students through enrichment programs such as Robotic, as well subject tutoring and other interventions for struggling students. 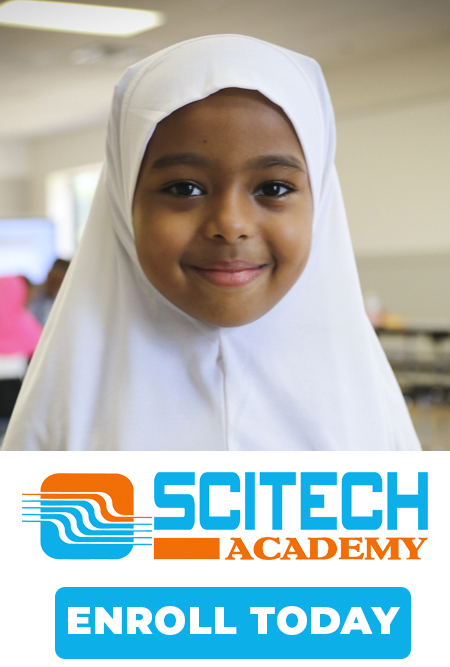 SciTech Academy believes that learners acquire genuine self-esteem through the challenge of academic accomplishment. The school will have high expectations so that all its students will obtain the knowledge and skills they need for success in their further education and careers. The school follows a rigorous curriculum that is a systemic, progressive program with mastery of specific knowledge and skills at each grade level. The program is aimed to be challenging to, but not too difficult for average students. With a focus on mastery of core knowledge and skills, teaching methods provide appropriate support and challenge for all students. Integrated assessment to confirm student progress and identify the need for intervention or further improvement. Timely and complete communication with parents establishes a partnership that promotes an environment most likely to achieve success for all students. Most instructional time is spent teaching the standard curriculum to the entire class. replace the teacher's obligation to cover material in class. In order to provide students with a dependable, least restrictive learning experience. pull-out programs are avoided unless is necessary. At SciTech Charter School, the faculty inspires students to achieve their greatest potential as learners and responsible members of a caring, supportive community. Teachers motivate students to strive to a high academic standard. In striving to meet academic challenges, students may struggle. SciTech Charter School provides support for students to achieve without lowering the bar, starting with the classroom teacher and including additional tutoring through the Support and Challenge team. From their first moments at the School, students learn that, in achieving their fullest potential as citizens and learners, confidence comes from competence in achieving their fullest potential as citizens and learners in SciTech Academy community.